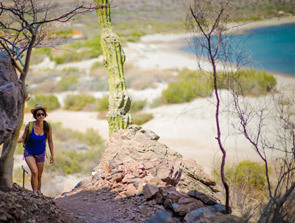 Located on the eastern coast of the Baja Peninsula, Loreto possesses an unforgettably tranquil location on the Sea of Cortez - worlds away from the bustle of Los Cabos. The warm, pristine waters around Loreto are legendary for sport fishing, with marlin, sailfish, dorado and numerous other species abundant among the offshore islands. Once a sleepy and remote outpost visited only by a handful of hardy travelers, Loreto today is embracing thoughtful development that honors the history and ecology of this unique setting. Villa del Palmar at the Islands of Loreto is an excellent beachfront resort with magnificent views of the Sea of Cortez and great amenities. Visitors fly into Loreto International Airport (LTO). Flights are available from Los Angeles International Airport (LAX). Driving time from Cabo San Lucas to Loreto is approximately 6.5 hours. Loreto boasts a fascinating history as one of the oldest settlements in Baja. The enchanting colonial town offers an authentic glimpse of old Mexico and features a wealth of historical monuments including the 300-year old Mission of our Lady of Loreto, known as the "Mother of the Missions." Nearby, visitors can also explore the area's pre-Hispanic past by taking a guided tour of ancient native cave paintings. Loreto has been recognized by the Mexican Secretary of Tourism as a "Pueblo Magico" (Magical Town), a designation reserved for those locales exemplifying an oustandingly rich cultural heritage. Breathtaking scenery abounds, both on land and in the celebrated local waters. Divers can explore underwater caves, rock reefs and seamounts. Kayaking is an excellent way to explore secluded beaches and enjoy views of the cactus-studded hills. As the breeding and birthing ground for migrating whales, the Sea of Cortez offers remarkable and intimate whale watching opportunities. 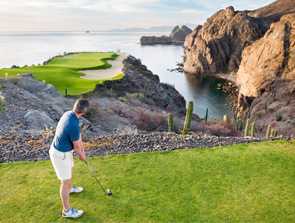 Loreto Bay Golf Club, a David Duval 18-hole signature course, offers a stunning setting with glimmering ocean views. A new course is also under development in the area.